President Bush signed into law a $38 million grant program to preserve notorious internment camps where Japanese-Americans were kept behind barbed wire during World War II. The money will be administered by the National Park Service to restore and pay for research at 10 camps. The law is intended to help preserve the camps as reminders of how the United States turned on some of its citizens in a time of fear. The camps housed more than 120,000 Japanese-Americans — U.S. citizens and residents — under an executive order signed by President Roosevelt in 1942, when America was reeling from the Japanese attack on Pearl Harbor, Hawaii, on Dec. 7, 1941. At the time there were fears that Japanese-Americans were loyal to Japan. Roosevelt's order prohibited them from living on the West Coast, in a position possibly to help an invasion force. Thousands of families in California and parts of Washington state, Oregon and Arizona were pushed from their homes and into camps surrounded by armed guards. The sites named in the legislation are in California, Arizona, Arkansas, Colorado, Wyoming, Utah and Idaho. The last of the camps closed in 1946. President Bill Clinton called for the preservation of the camps in 2000 and signed a memorandum seeking recommendations on developing more opportunities for the public to learn about the internment. The law signed by President Bush will give grants to nonfederal organizations for historical, research and restoration work at the sites named in the legislation, as well others selected by the head of the Interior Department, which includes the National Park Service. 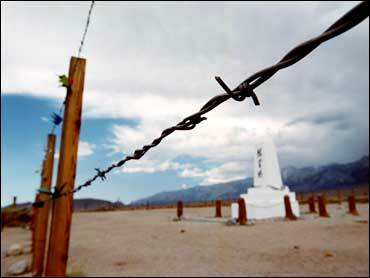 The National Park Service already operates facilities at two of the 10 camps: the Manzanar National Historic Site in California and the Minidoka Internment National Monument in Idaho. Co-sponsors of the bill included the two current members of Congress who spent time in the camps as children: Democratic Reps. Mike Honda and Doris Matsui of California. Matsui was born in the Poston camp in Arizona. Two camps in southeastern Arkansas — the Jerome Relocation Center and the Rohwer Relocation Center — held 16,000 detainees between 1942 and 1945. At its peak the camp at Jerome had 610 buildings on its 500 acres. Not much of the original camp survives. A water-treatment reservoir and a smokestack from the camp hospital are the only structures left. The Rohwer camp, once 500 acres, includes the graves of 24 who died at the camp and several memorials. President Reagan signed a presidential apology to Japanese-Americans in 1988.